In the early 1900s the death rate for babies was high. It was especially high in the South. This was before antibiotics were available. There were few rural doctors and few pediatricians at all. Heat and humidity, flies, contaminated milk and misinformation on infant care led to a high mortality rate for children under two. Dr. Daniel Lesesne Smith wanted to do something about this. In 1914 he started the Infants’ and Children’s Sanitarium and the Spartanburg Baby Hospital. Dr. D. L. Smith believed that most infant illnesses were caused by improper feeding and care. He believed that training mothers to be caregivers would make the most difference in lowering infant mortality. 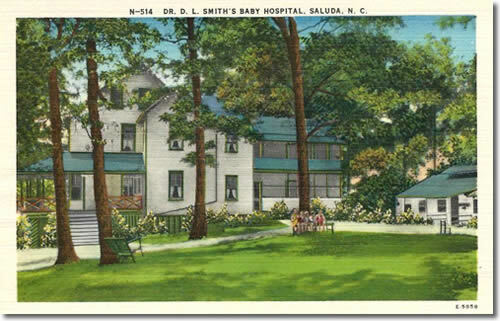 Dr. Smith and his family spent summers in Saluda to get out of the heat and humidity. He believed that the healthful climate of Saluda would benefit sick babies. He founded a summer sanitarium in Saluda where he could give mothers accurate information on caring for their babies and mother and baby could benefit from the healthy air. His common-sense approach emphasized the mother’s role in wellness in babies. He focused on cleanliness, climate, fresh food and breast milk. In 1921, he opened the Southern Pediatric Seminar in Saluda with Dr. Frank H. Richardson. The motto was “Better Babies in the South.” They invited general practitioners to come for a two week course providing accurate information on caring for infants. He invited instructors from around the country to teach the diagnosis, prevention and treatment of childhood diseases. Dr. D. L. Smith made a difference. He continued to work in the hospitals until his death in 1947. His wife kept the hospital open with the assistance of physician Sammy Elsmore. The Infants’ and Children’s Sanitarium closed when she died, in 1951. The Spartanburg Baby Hospital closed in 1953. In 1958, the Southern Pediatric Seminar was discontinued. By then pediatric courses were taught in all medical schools. The pediatrics section of the Seminar moved to Morehead City, NC. The Ob/Gyn section of the Seminar still holds a conference every July at the Grove Park Inn in Asheville as the nonprofit Southern Obstetric and Gynecologic Seminar. Saluda Historic Depot has a monthly event on railroad history and the Saluda Grade called Saluda Train Tales. August 2018, Saluda Train Tales interviewed three grandchildren of Dr. Lesesne Smith. They told how the Baby Hospital came to be. A local paper, the Tryon Daily Bulletin carried the story on August 9, 2018. Lesesne Smith was born in Berkeley County on July 28, 1877. He grew up in Mt. Pleasant and graduated from Porter Military Academy. He was in the first class to matriculate at Clemson. He established the Spartanburg Baby Hospital, a charity institution, as well as his private Infant’s and Children’ s Sanatorium.